A mimic exudes a thick slime that acts as a powerful adhesive, holding fast any creatures or items that touch it. An adhesive-covered mimic automatically grapples any creature it hits with its slam attack. Opponents so grappled cannot get free while the mimic is alive without removing the adhesive first. A mimic deals 1d8+4 points of damage with a successful grapple check. 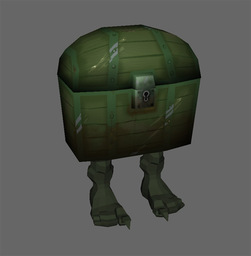 A mimic can assume the general shape of any object that fills roughly 150 cubic feet (5 feet by 5 feet by 6 feet), such as a massive chest, a stout bed, or a wide door frame. The creature cannot substantially alter its size, though. A mimic’s body is hard and has a rough texture, no matter what appearance it might present. Anyone who examines the mimic can detect the ruse with a successful Spot check opposed by the mimic’s Disguise check. Of course, by this time it is generally far too late. A mimic has a +8 racial bonus on Disguise checks. Ixy met the Moonhowlers while he was in the employ of Kazmodjen, the evil half-dwarf slaver of the Malachite Hold. Ixy was charged with the task of guarding Starbrow, Keyghan Gelve’s rat familiar, while it was being held hostage in return for Keyghan’s silence about the skulks and creepers using his lockshop as a secret entryway into the city of Cauldron. Ixy grew to like Starbrow and learned a lot about the Above-World from the little rat during their long days of captivity. The mimic came to understand that Kazmodgen was truly evil and the mimic underwent an epiphany, of sorts, and made the decision that he would no longer serve those with evil intent. When the Moonhowlers offered Ixy the opportunity to leave Kazmodjen’s service AND to live Above Ground, the creature jumped at the chance. Plus, Braenna has a tendency to feed the mimic all manner of goodies, so he feels extra loyal to the young dwarven maiden. These days Ixy spends his time in a spare apartment at the Shrine of Pelor in Cauldron where he guards the Moonhowler’s treasure. Ixy doesn’t consider the job at all, with a balcony all to his own where he can perch upon the rail and spend all day looking out into the busy city of Cauldron, Ixy considers this more like paradise. The Moonhowlers always remember Ixy and often bring him treats to nibble at or gulp down, whatever the occasion demands. Braenna and Braeden also take Ixy for walks in the evening and sometimes they even take him into the various taverns and inns where he can listen to the bards sing and play. So far, Ixy has learned to change shape into a chest with many human feet, a parasol and a grandfather clock.